Re: Two other SDP40F's still around in '08? I'm moving this to the EMD forum; the discussion on this locomotive is not about its Amtrak era service from what I read. westr wrote: I was aware of these SDP40Fs from Jim Hebner's Amtrak Photo Archive at http://www.hebners.net/amtrak/ but I didn't know that they were still around. Its nice to see that they apparently are. EMD #268 was Amtrak #531 and EMD #169 was Amtrak #609. As Byte said, EMD found uses for them after Amtrak traded them in on F40PHs; Santa Fe never owned them. As for 644, it still qualifies as the only PRESERVED SDP40F. Though it carries DLMX reporting marks and lives at Brooklyn Roundhouse, as far as I know it has never belonged to Doyle McCormack, though he's obvioulsy involved. It was saved by Chris Fussell, who also saved F40PH #231, and I think it either belongs to him or to the Northwest Rail Museum. 2. The 644 isn't stored at the Brooklynn roundhouse. 3. The 644 does NOT carry the reporting marks DMLX. 4. The 644 carries the reporting marks NRMX. 5. The 644 is FRA blue carded as a SDF-40-2, not a SDP-40. 1. 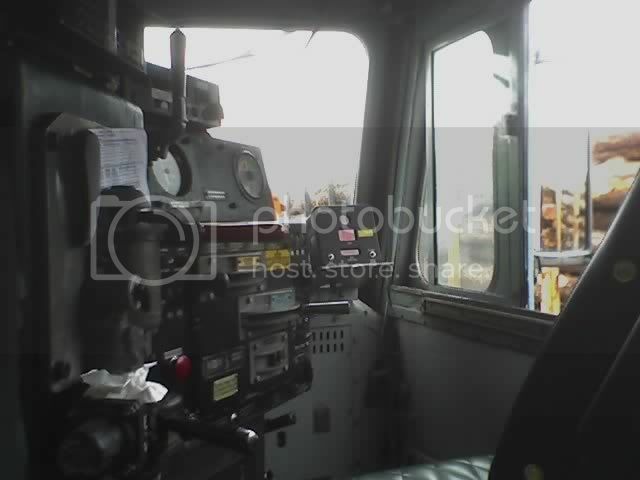 Firemans & Conductors seat, left side of cab. EBV visible. Two switches on bulkhead control cab "heaters", firemans side. 2. Engineers side (right side) from center of cab. Note speedo/foot rest. 3. 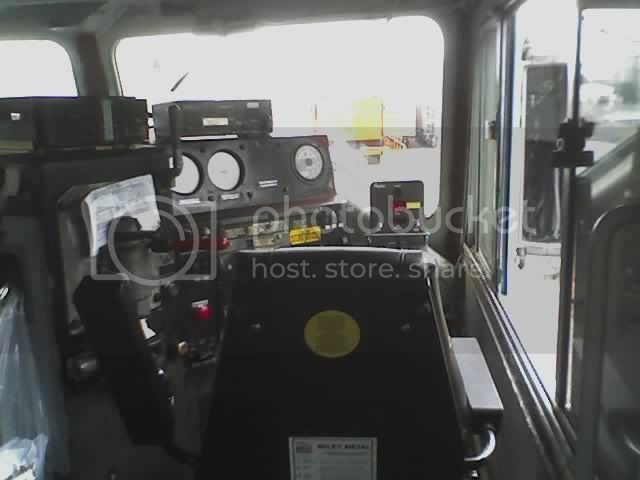 Right side cab exit door, directly behind engineers seat. Door on right goes to engine room. 4. View of Engineers side of cab, looking forward. 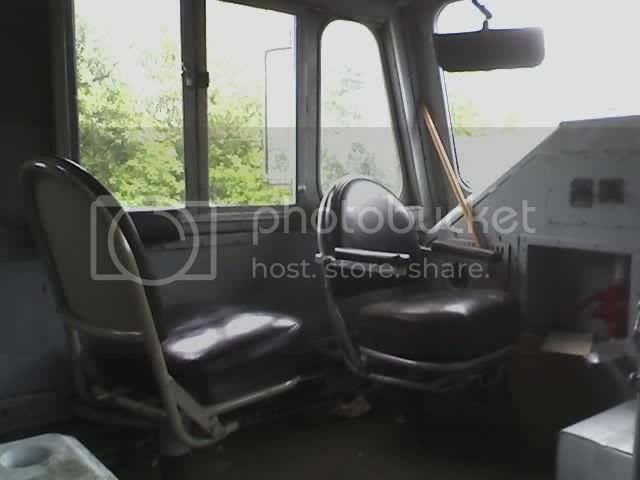 The best part of this loco, a new cab seat. 5. Nose door in front center of cab, to front porch, and terlet........ 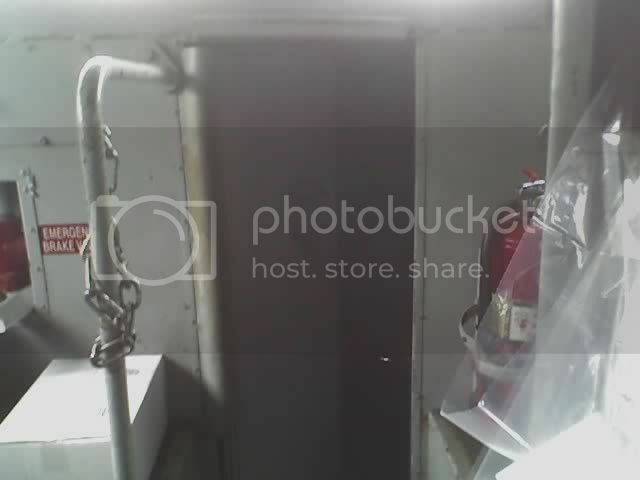 Garbage bag, fire extinguisher and box of water visible. Thanks GOLDEN-ARM for the great cab pictures, and the insights from someone who has operated this engine. You are absolutely correct that Doyle McCormack does not and never has owned 644, it is not currently at the Brooklyn Yard, and that it is currently a freight-only SDF40-2. I didn't give the full story (as I know it) before, because this was an Amtrak thread, but now that its an EMD thread, its appropriate. 644 was built as Amtrak SDP40F #644. It was one of several sold to Santa Fe (in exchange for switchers I think). Santa Fe rebuilt their ex-Amtrak SDF40Fs, removing the passenger heating equipment, adding a front platform and other changes, designating them as SDF40-2s (a designation ATSF made up). They lasted long enough for some of them to get BNSF numbers; this one was #6976. Shortly before being retired, it was painted in its current color scheme for the Maersk/Sealand special train, which let it outlast the other BNSF SDF40-2s. After it was retired, Chris Fussell, who had already acquired Amtrak F40PH #231, acquired BNSF #6976. It was moved to the Brooklyn Roundhouse (after some other stops) where it was repaired to running condition and numbered back to 644. It was at Brooklyn for months, maybe as long as 2 years, and was clearly visible from the Holgate overpass (with that paint job it was hard to miss). It left Brooklyn when short lines were willing to lease it. My pictures of it were taken in Lebanon, on the Albany & Eastern, in Sept. 2006. If no one is willing to lease it, it would most likely return to Brooklyn. I know its not there now, and figured, through wasn't sure, that it was on the P&W somewhere. I'm not certain about 644's reporting marks, as I've never seen it wear any since its BNSF days so I'm willing to accept that it has NRMX reporting marks now. (I assume thats what you meant, as NMRX is the New Mexico RailRunner commuter train) It may have also had DLMX reporting marks in the past. Just because Doyle didn't own it, doesn't mean that he didn't allow it to wear his reporting marks if the real owner didn't have marks of their own. I don't think Doyle personally owns #4449's tool & crew cars, but they have always worn DLMX marks. As for whether or not 644 is "preserved," I don't think condition matters. There's a lot of "preserved" steamers rusting away at city parks and museums all over the country. 644 was acquired with the intent of retaining it for its historic value, and in my mind that qualifies it as preserved. But, that's a matter of opinion. Oh, and I think "Powerpuff" is a great nickname for it. 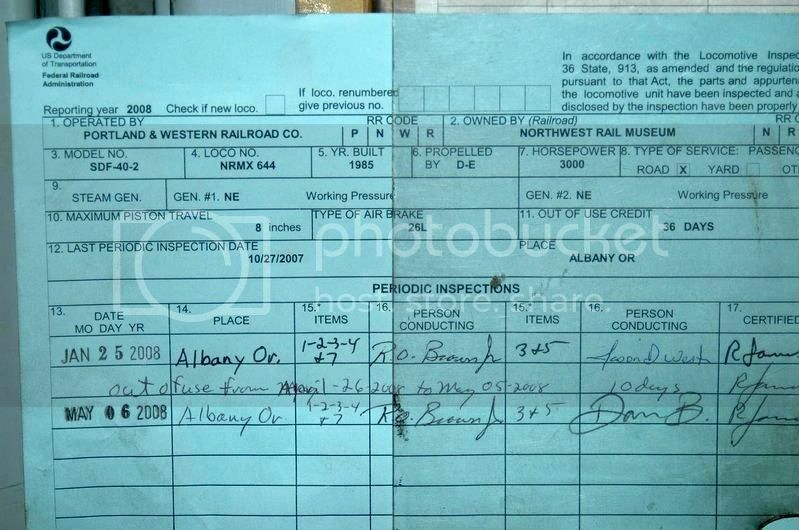 The official reporting marks for the 644 is DLMX. NRMX is registered by a company somewhere east of Chicago, and has no affiliation with the organizations out west. 644 is owned by the Northwest Rail Museum, and officially reports as DLMX 644. Take it up with the FRA. The Blue Card in the cab has the following info: Owned by: NRMX, Operated by: Portland & Western The Blue card says NRMX, not DMLX. I've run it, dozens of times. Have you? Doesn't matter what you want to call it. What matters is, the data printed on the Blue Card. I hope you're treating it with respect, it ran well last time I operated it, wouldn't want a locomotive I bought go to the dumps. dave76 wrote: I also heard CSX is also converting the SD80MACs to the 16-710, not due to problems with the 20-710, there now in for there full overhaul ,but just because its cheaper for the 16, and will consume less fuel. The 20 cylinder engine costs quite a bit more, I don't the cost offhand but someone posted the difference at an earlier post sometime back. Dave to my knowledge CSX is not converting the SD80 to a 16 cylinder 710 engine. The Huntington Heavy Repair Shop is doing Standard Repairs on the 13 SD80's they own and they are not changing the engine, atleast not at this time. This certainly sounds familiar! 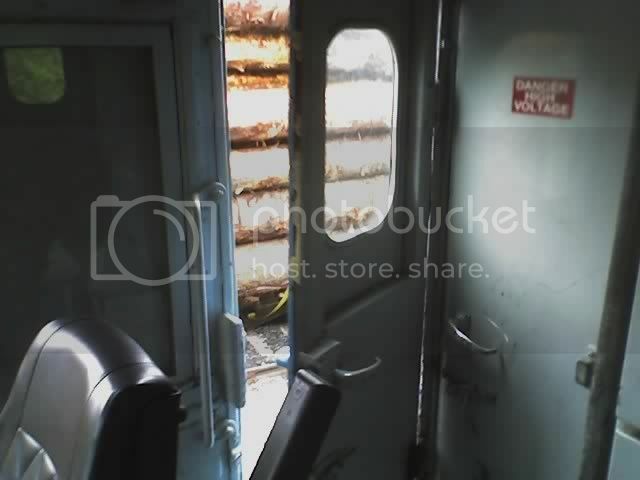 Do ALL EMD cowl units rain inside the engine compartment like that? Do you have to drain the retention tank every time it rains? Can anyone tell me how I can figure out which nose length's are on 2 SD40-2's? NYSW has a former NW SD40 and a former Southern SD40-2 both originally high hoods. Both have been fully rebuilt from the trucks up. Im trying to figure out if they are 81 or 88 inch nose's. The original SD40 has now been retired. It served on the IC and CN. Hope this unit finds a home. Whats the advantage of de-turboed SD40 or SD40-2? Are they more fuel efficient in yard service?